This is the fourth in a series of Friday posts about apps I find interesting, useful, and maybe even fun. I hope you will return here often to see what I am sharing and to perhaps share YOUR ideas as a comment or in an email to me. TinkerBox HD is a free interactive playground for learning and practicing physics and problem solving. STEM at its best! Build contraptions Rube Goldberg couldn’t have imagined to solve problems, share them with friends, and even create your own machines. This app is challenging and most appropriate for 12 and up, more about this below. Tinkerbox is an amazing tool to get students playing with physics and problem solving in a fun, motivating format. The app has built-in puzzles which are, unlike some similar apps, challenging from the very start. There are 6 levels of puzzles to solve, including levels which have microgravity or anti-gravity to contend with. This is one of those apps which seems to be strong at not only developing science content and problem solving but also science language… especially if you have students working together to solve puzzles. There is also an “Invent” section where students can create their own inventions without an app-provided goal, harnessing student imagination and interests even more. The built-in help (pictured below) includes element-by-element descriptions of how the elements function as well as a bit of historical or “real world” applications of each element. There is also a support and informational website at http://tinkerboxnews.com One of the coolest things at this website is a collection of student-made inventions which you can download, experiment with, and even edit on your iPad… just navigate to the website with your iPad browser and click to download an invention. It will open in your Tinkerbox app for you to explore and even change… just too cool! Having students work in teams to solve puzzles while encouraging scientific language and discussion seems like a simple classroom implementation of this app. 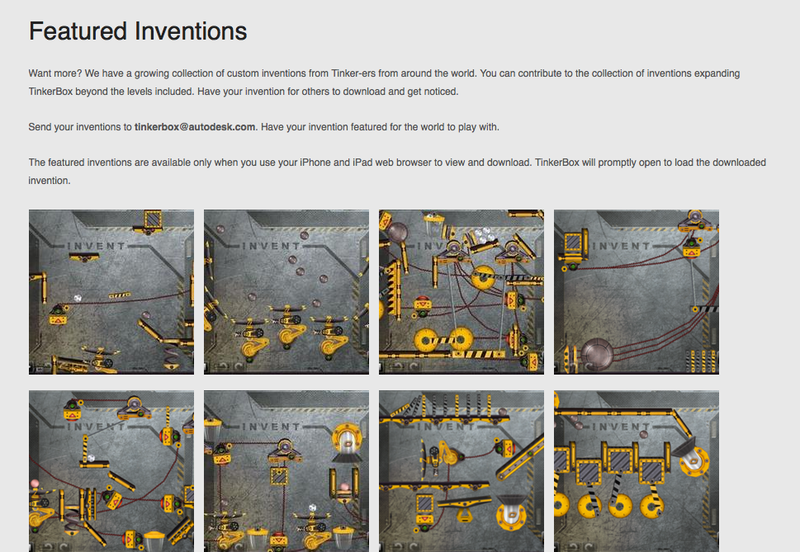 Students can also, using the invent mode, create working “contraptions” and share these via email… or even send them to AutoDesk for possible inclusion on the Tinkerbox website for other students to download. As a part of a STEM effort this could really help students learn and grow in their understanding of physics, especially if you join in the discussions offering the “academic” explanations and vocabulary as it is unearthed by your hard working students.